The summer months are here, and you’re spending most of your free time out in the backyard (poolside, if you’re lucky!) with friends and family. And somehow, a lazy Sunday afternoon always seems to turn into an impromptu barbecue party. Stock up on the following items to ensure your next last-minute shindig is a huge success. Nothing says “lazy summer days” like comfortable (and chic!) patio furniture. And you don’t have to drop stacks of cash to have your backyard looking good. You can find a set of four chairs and a smallish table in the $200 price range at some shops — and right now, you might find lots of such items on sale because it’s late in the season in retail-land. If you’re feeling extra-adventurous, try decorating your yard in a fun summer theme. A barbecue isn’t worth it unless you’ve got the right machine doing the dirty work. The size of your entourage will determine the size of your grill, but there are plenty of styles and brands to choose from. If you’re a fan of charcoal-flavored meat but don’t like the work that goes into a large barbecue, opt for an indoor grill. You’ll reap the benefits without having to put in the same amount of effort. Summer is a time for lighthearted fun, and what better way to reflect the carefree feel of the season than brightly colored dishes? Have fun with your summertime cutlery: Choose eye-catching hues and bold prints. Try buying two different sets that have similar colors or patterns so you can mix and match throughout the season. Music might be the one thing that can make or break a fiesta, so choose wisely. If you’re looking for a laid back day in the sun, opt for something mellow and “beachy” like any southern California, Sublime-esque bands. If a poolside dance party is what you seek, well, tune to any station on the radio. Let’s face it, your guests can only lounge on a chair for so long or swim so many laps before they get bored. Keep them entertained with lawn games such as volleyball, bocce ball, horseshoes, Frisbee or grass bowling — any activity that allows for group play is ideal. The party doesn’t have to end when the sun sets. 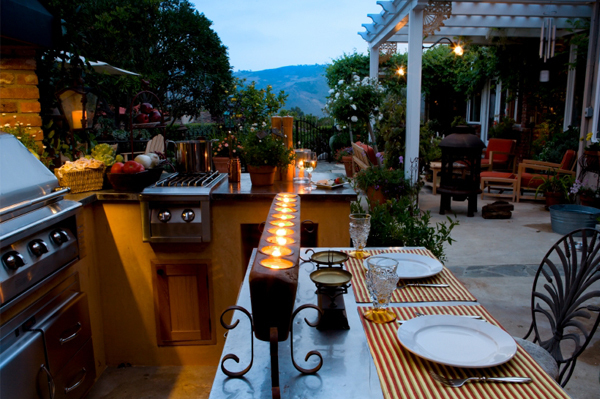 Keep the festivities going with some fun outdoor lighting options. Dot the perimeter of your yard with tiki torches for a Hawaiian luau theme or strategically place a few faux torches around the area for a more dramatic feel. Special lighting will help set the mood for your party and keep it going well into the night!